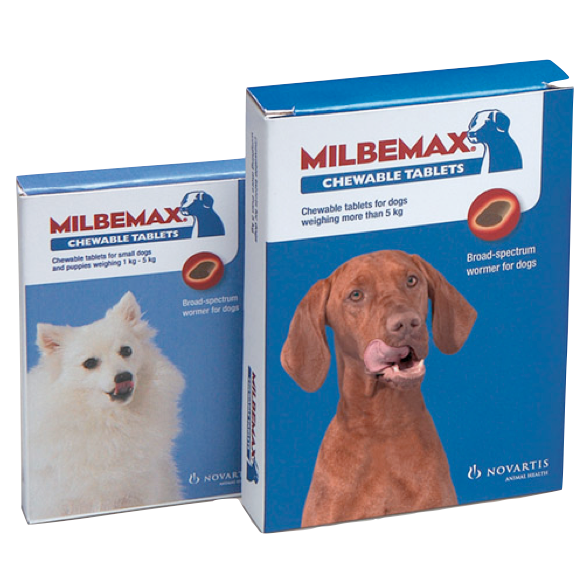 Milbemax Chewable Tablets are a palatable, broad spectrum worming tablet that treat against all worms found in dogs, including lungworm. Milbemax tablets are effective against roundworm (including ascarids, hookworm & whipworm); tapeworms; heartworm & also prevent against lungworm. Worms can be a serious threat to your dog's health & wellbeing, so routine worming every 3 months is essential. To treat for lungworm (Angiostrongylus vasorum), milbemycin oxime should be given 4 times, at weekly intervals (the first time with Milbemax & the subsequent 3 treatments with milbemycin oxime only). Warnings & Contraindications- Do not use on dogs who weigh less than 5kg. Pregnancy & Lactation- Safe to use during pregnancy & lactation.